Emirates will offer four daily flights between Sydney and Dubai from March 25 2018 as the airline moves to replace the capacity being withdrawn by alliance partner Qantas. The new service EK417 has been scheduled as an early evening departure from Sydney, arriving in Dubai a little after midnight. The reciprocal EK416 takes off from Dubai in the evening, arriving in Sydney in late afternoon. The flights will be operated by Airbus A380s. Emirates’ new flight from Sydney closely mirrors the current A380 Qantas QF1 schedule, which is being rerouted from Sydney-Dubai-London Heathrow to Sydney-Singapore-London from March 25 2018. However, QF2 takes off from Dubai in the morning, compared with the new EK416’s evening departure. Emirates said in a statement on Wednesday the new service would compliment Qantas’s changes to its flights to London. 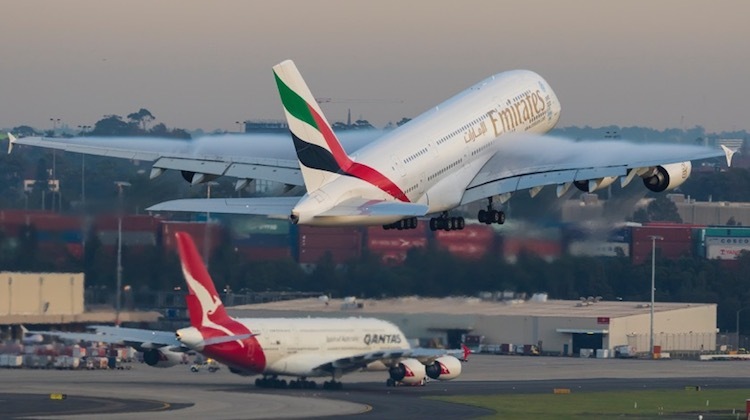 Currently, Emirates’s three Sydney-Dubai flights, all served by A380s, depart at 0600, 1830 and 2110 daily. The departures from Dubai are scheduled at 0150, 0845 and 1015. It is the latest move from the Dubai-headquartered Emirates in response to changes to Qantas’s London operations. Qantas announced in late 2016 it was ending its Melbourne-Dubai-London A380 service in favour of a Melbourne-Perth-London offering with Boeing 787-9s, linking the continents of Europe and Australia with regularly scheduled nonstop passenger flights for the first time. Then in August, Qantas said it would withdraw from Dubai entirely by rerouting its Sydney-Dubai-London flights to Sydney-Singapore-London. It would continue to codeshare on all Emirates’ flights out of Australia as part of their alliance. The fourth daily flight from Emirates restores that lost capacity from Qantas exiting the route. Emirates has also previously announced it would move to three daily flights between Brisbane and Dubai (including one via Singapore) and upgauge one of its three daily Melbourne-Dubai flights to an A380. The changes will mean Emirates will operate 91 flights a week between Australia and Dubai by March 2018, compared with 77 a week currently. The airline serves Adelaide, Brisbane, Melbourne, Perth and Sydney from its Dubai hub, with some flights operating via Singapore or Bangkok. Qantas and Emirates plan to seek reauthorisation from the Australian Competition and Consumer Commission (ACCC) for their global alliance that was first struck in 2013.
closely mirrors – except its half entirely different! These departure and arrival times mirror those of EY451/EY454 and the-new-Qatar-flight-from-next-year/QR908. Would they do the sameness for Melbourne soon? To kind of cover the QF 9/10 run that’s now off to Singapore. Glad Qantas moved back to Singers. Disgusting that QF CEO Alan Joyce is getting $25 million pieces of silver for aiding and abetting and facilitating Emirates becoming the unofficial flag carrier of Australia. Dubai is, after all, just a city in the sand and 90% of its business from Australia has been raped and pillaged away from QF because of Alan Joyce’s failure to set QF up for the future.